Specter-2 and Specter-3, report! 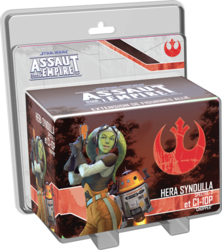 Bring a touch of mischievous command and play to your Assault on Empire games with Hera Syndulla, Specter-2 and C1-10P, "Chopper". Fight alongside these veterans in any campaign with the "Extraction Phantom" mission. This expansion also contains new Command Cards and two unique Skirmish missions to play one on one.